Published in the South Kent Gazette, 23 January, 1980. Between a small house built on the north-east comer of this land and the store at the bottom of Upper Townwall Street (alias Clarence Street), there was a cul de sac, which few people entered, unless they had business at the back of the neighbouring houses; but a peep into it gave a good idea of the bed of the old defensive moat which ran from the river to the Moat Bulwark behind Guilford Battery. Until the widening of Woolcomber Street, in 1894, there stood between the top of this street and Woolcomber Street a coal store, belonging to Mr Bussey, beside which was only a foot passage leading to Woolcomber Street; and, until the year 1800, the site of this coal store was the burying ground of the Society of Friends. It may be of interest to mention that in this burial ground there were no tombstones, for the people called Quakers not only ignored all social distinctions amongst the living, but they also prohibited the erection of any stone or monument to give pre-eminence to one Friend over another when they were dead. From the year 1665 until 1800, the members of the Society of Friends were buried in nameless graves in that little piece of ground just outside the walls of Dover; but, in the year 1851, the Dover Society made a concession to the extent of allowing stones, plain Yorkshire or Portland, not exceeding 3ft. in length, and 2ft. in breadth, to be laid flat and uniformly on the middle of the graves, bearing only the names, ages, and dates of death. But in the little place at Townwall Lane there was no such distinction, although some of Dover’s leading public men were buried there. St James’s Street, especially the lower part, is mainly interesting as a remnant of old Dover. The bottom of the street was thrown open to the river by an improvement which removed an old building which crossed the bottom of the street and had made it a dead-end but for a narrow lane this way and a narrow lane that way. Some of the old world interest of this spot passed away when the “Red Lion“ Inn, at the left-hand corner, was rebuilt about 1900. The inn was hit by a bomb from a German seaplane in January, 1916. The roof was blown off, and a barman, who was in an upper room was killed. The old one had historic associations with the coaching days, when it was a house of call on the way to Deal and Thanet. In the decayed premises which once formed the dead-end of the thoroughfare, there were traces of carving in the doors, which in the Jacobean days they only expended on houses that were considered high class. 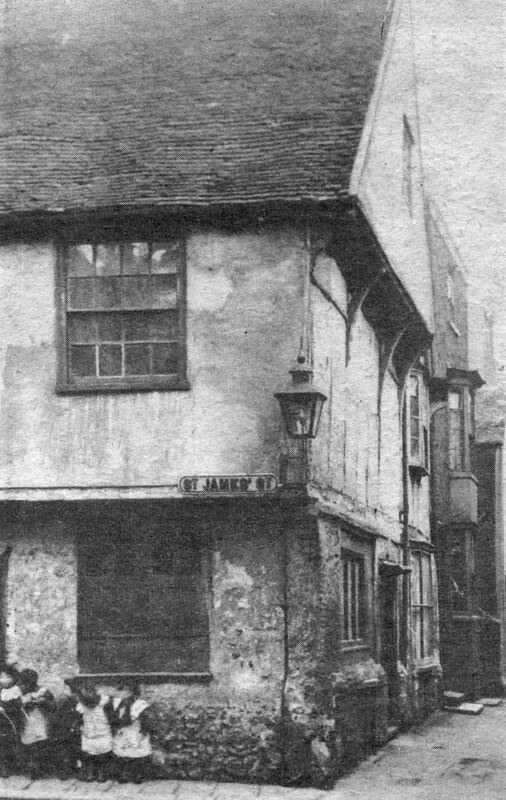 On the right-hand of this street, near the bottom were some curious relics of the past in two doorways, and the projecting upper storeys, thrown into prominence since the improvement, were marks of the ancient domestic architecture, of which there are scarcely any other samples left in Dover. Hereabouts, in the 1970s was a well known private school, conducted by Mr G. Stockwell. A little higher up, on the right-hand side, was a building which looked quite modem—No. 82—which had historic associations with the early days of the Society of Friends, for it was here that their first meeting house in Dover was established, in the year 1665. Two members of the Society, named Caton and Stubbs, came to Dover in that year, and gave addresses in the open air, when both the Magisterial authority and the mob persecuted them; but there were two local men of influence, Luke Howard and Daniel Bean, who joined them and helped them to form a Society in Dover, opening a meeting house at No. 82, which was continued there until the place of worship in Queen Street was built about the year 1800. This Society continued to be much persecuted during the whole of the reign of Charles II, and Luke Howard was imprisoned in Dover Castle for refusing to take an oath. After the Friends gave up their meeting house in St James's Street it was used as a Temperance Hall, and here the first Dover Temperance Society came into being. Parking one’s car In Russell Street car park today it is hard to believe that busy St James’s Street, part of the original route of stage coaches between Dover, Deal and Thanet, passed over the site. 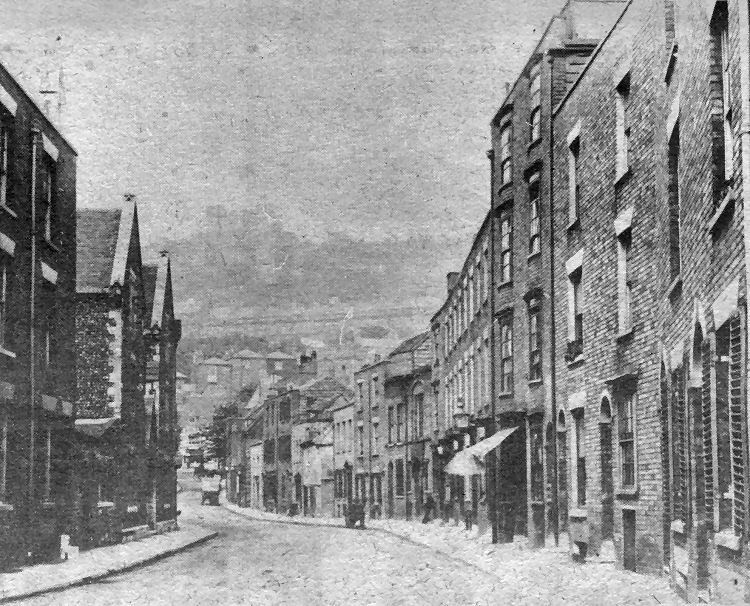 This view, looking towards the ancient "White Horse" public house and the castle, was taken before the first cars and lorries arrived on the scene but even then corners at either end of the thoroughfare were proving a problem as the volume of horse-drawn commercial traffic mounted. This view shows the section of the street between Woolcomber Street and rector’s Place, which is now part of Bussell Street. Pictured on the left is the double-fronted St James’s School. The picture above, is an even earlier photograph showing a 14th or 15th century cottage, with flint foundations and walls up to the first floor, with timbers above. The building, like all the St James’s Street properties pictured above, has long since disappeared. It stood at the junction with St James’s Lane and in the 1890s, if not before, and into the 20th century, was one of Dover’s earliest pet shops. In the 1900 street directory the owner is listed as F. Chatwin, dealer in birds. St James’s Lane, part of which is shown on the right, ran from Townwall Street to King Street. Opposite the building in the picture stood the old Town Mill and further on, at the Townwall Street junction, was the colourful-looking "Robin Hood Inn."